Client Base in New England? 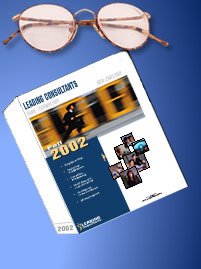 Leading Consultants for High Technology in New England and accompanying CD publishes its next edition for Fall, 2002, with a distribution of almost 3,000 personnel and technical managers in all high-technology companies in New England with greater than 50 employees. That's significant targeted visibility for any consultant. What Do You Get By Listing With Us? Up to 1 megabyte of brochures, samples, references, and other documents on our accompanying searchable CD (see file format restrictions). Your personal copy of the directory and CD...see your competition! 5 different keywords for the Index (makes it easy for them to find you by skills). Assume you are a manager who needs the services of a consultant, and a completely FREE directory shows up on your doorstep. You can easily search by skills in the Index. Or you can search the CD. You don't have to pay for the directory, and you don't have to pay an agency or finder's fee...wouldn't you use it? Well-defined audience: sizable high-technology company decision makers. Long shelf-life: directory will be printed twice per year, so it has 6 months of shelf life. Real decision makers don't get to spend a lot of time online. The printed directory lets them search at their convenience...at lunch, on the plane, at home, by the pool. You Aren't an Employee...You're a Business! As a consultant, you've probably wasted good money advertising your services in places that didn't work, mainly because the affordable places for consultants to advertise are affordable for a reason (newspapers with limited shelf life, and so forth). Be serious about your business image.